These release notes provide information for the 2.2.0 release of the Alfresco Application Development Framework. This a General Available release of the Application Development Framework, which contains the Angular components to build a Web Application on top of the Alfresco Platform. In this release we have focused on enhancing existing components, such as the Viewer which now supports thumbnails, previewing images and enhanced configuration. 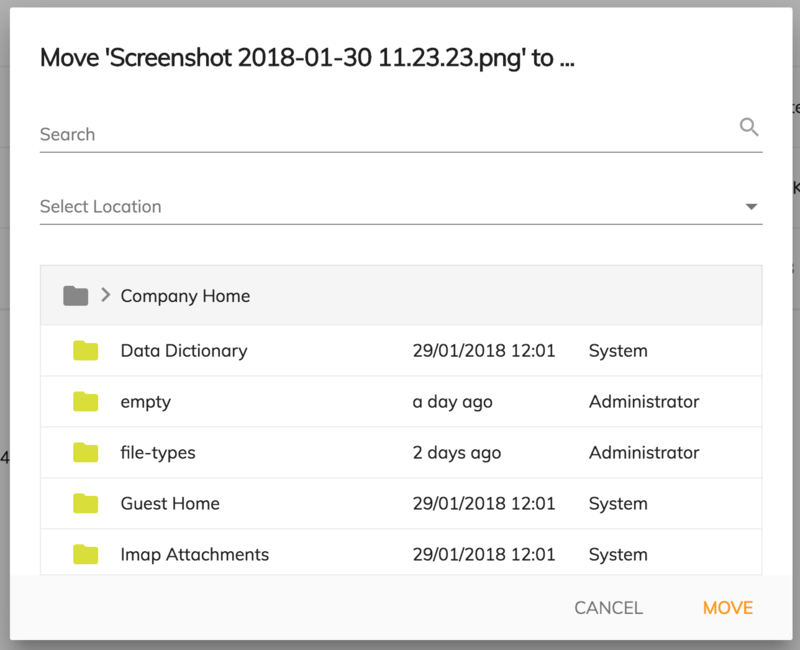 The Data Table and Document List have added initial support for a card and gallery view and forms now have a date time widget. See all the new features below. We continue to keep a balance between improving existing components, adding new ones, and also improving the underlying architecture to prepare for future components such as faceted search. Besides the aspect oriented configuration, it is now possible to configure the groups and properties in a more detailed way. With this type of configuration any property of any aspect / type can be "cherry picked" and grouped into an accordion drawer, while defining a translatable title in the preset configuration. This improvement was a proposed solution to a community-raised issue regarding the usage of the component. To help developers configure the application in a more error-proof way, the app.config.json file now has a schema validator. This schema is part of the core package and will be inside the Yeoman-generated application from now on, by default. Every time a component gets an update which involves using the app.config, the schema will be updated to the new interface to validate the configuration file. Support for "carousel" modes and document navigation options (extra buttons you can enable and provide handlers for). This feature will be fully demonstrated in the upcoming "Alfresco Content Application" release. For the current release, the Destination Picker UI has been greatly improved. With ADF 2.2.0, the app list component is shows the mat-spinner until the apps are loaded. You can decide which properties the Task header component should render from the app.config.json file. By default, the component will render all the available properties. You can restrict those by changing app.config.json. For instance, in this example, I would like to show the id, priority, parentName, and status. As with the Task List, now you can create your own process list with static and dynamic columns. You can declare the static columns that your process list should show from the "app.config.json" file using custom presets. We have added the new date time widget provided with APS 1.7. This widget lets you choose the date and the time in the format given by the APS form. We have added a new menu for actions to perform on the Upload widget. We have provided 3 actions for each file added : Show , Remove and Download. Clicking on the Show button will trigger the viewer to open with the given document. Clicking on the Download button will allow you to download the selected file. Clicking on the Remove button will remove the file from the Upload widget value. We enhanced the search control component by adding the option of customizing the template shown when no result is found via the tag adf-empty-search-result. This lets you customize the empty search template as you want. [ ADF-2197] - 'Process Heat map' is not showing the proper informations related to the dropdown. [ ADF-2026] - Breadcrumb displays wrong path after reloading the page. [ ADF-2118] - Process Initiator should be able to complete a task. [ ADF-2235] - User names and icons are not being retrieved if user has a profile picture. [ ADF-2242] - Search on custom sources is not working. [ ADF-2243] - Translation is missing for the 'Extended Search'. [ ADF-2263] - Translation is missing on delete warning messages when user has no permission. [ ADF-2311] - Content Metadata Card component does not work for folder node. [ ADF-2346] - Name and profile picture is not displayed when trying to assign a user to a task. [ ADF-2307] - Add a data-automation-id tag for Process Services navigation bar. Please refer to the Alfresco issue tracker for other known issues in this release. If you have more questions, please reply here or contact us using gitter .